In July 2008 I requested that Wikipedia remove their Psaier biography because none of the information was backed up by reliable third-party sources. They agreed with me and removed the biography after a week's debate. That debate can be read here. An early version of the original Wikipedia page can be found here. Some of the misinformation floating around about Psaier is also dealt with on the Pietro Psaier page of the About.com site. You can read it here. During the interview "Pietro Psaier" told the journalist that he was 26 years old. This would mean he was born in about 1964, which would have made him far too young to play any sort of role at Warhol's Factory. After I pointed out on the About.com website that if the photo was from 1990 Psaier must have been a toddler during his 60s Warhol days, the Antiques Trade Gazette offered an explanation for the age discrepancy in an article that appeared in the June 8, 2009 issue. They note: "Just how much of the detail can be relied on in Aznar’s 1990 interview with Psaier is not clear, as she herself admits he jokingly lied to her about his age. Appearing much younger than his years, he claimed to be 26, when in fact he was 54 at the time." An article in the August 18th issue of the Antiques Trade Gazette also noted that in a leaflet on Psaier "One of the photos is attributed to a 1993 issue of Downtown magazine, dating the exhibition as later, although it is the same photo that appears in the 1990 El Independiente Jovenes article." 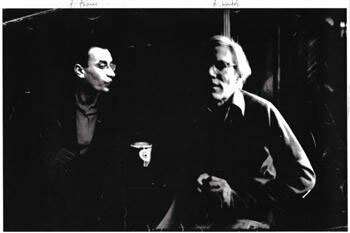 And if that was a photograph of "Pietro Psaier" in 1990, how old was he in the following photograph with Warhol? (The photograph was distributed via Pressport with a John Nicholson press release for people to use for publicity purposes and, therefore, can be reproduced legally here - if you scroll down on that press release page you will see a "press kit" that includes the photo.) Warhol died in 1987 and the press release claims that Psaier's "relationship" with Warhol "continued on and off until the late 1960's." But surely they cannot claim that this is a photo of Psaier during his 60s Warhol years. If so, he has barely aged between this photo and the newspaper photo from the 1990s. Where and when was the Warhol/Psaier photograph taken and who took it? John Nicholson has produced Psaier's therapist to prove that "Pietro" existed. The therapist, who also happens to be "President" of the "Fundacion Pietro Psaier," recently released a statement to the Psaier "researcher" Jacqueline Chapman, in which he says "I have released my preliminary psycholgical [sic] profile to John Nicholson and Mrs. J Chapman and a copy of his death certificate." Was the death certificate issued in California, Spain, Italy or Sri Lanka? Given that Psaier was not a patient of the the therapist at the time of Psaier's alleged death in the tsunami in 2004 in Sri Lanka, how did the therapist happen to have a copy of Psaier's death certificate? May we see that death certificate? On another antiques site - "andantiques" on bttradespace - selling work by Psaier based in Haslemere, Surrey (where John Nicholsons is also located) there is a short bio of Psaier. An earlier version of that site noted in its "about us" section that "andantiques.com with its unique intermarketcharityshop department was set up in 2007 by Jacqueline and [name witheld]." The short bio for Psaier on the current version of that site, states "As the value of Psaier's works increases, the world of art is expecting to see another steep increase in the price of his work when he is sadly declared officially dead in 2011." But if Psaier is not to be declared officially dead until 2011, how did the therapist obtain Psaier's death certificate? 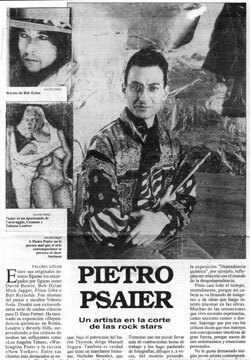 What did that press release say about the "estate" of Pietro Psaier and why was it taken off the net? If Psaier is not to be declared dead until 2011, wouldn't that delay the distribution of items from his "estate?" 1. "Some critics say that without Psaier and fellow artist Rupert Jasen Smith in the background, Warhol could never have produced and maintained production of the Factory commercial output." Warhol's original silver Factory closed at the end of 1967. It wasn't until 1977 that Rupert Jasen Smith became Warhol's printer. (Andy Warhol Print Cat. Rais., p. 278) Also, as one Warhol star has pointed out to me, Rupert was born in 1953 which would have made him 11 years old when Psaier was alleged to have met Warhol. "Peter the Italian" is not mentioned in any books on Warhol. In the Warhol biography by Victor Bockris, someone referred to as "Sammy the Italian" who is described as “a friend of Ondine’s whom nobody else at the factory knew” tried to rob Warhol at the Factory. (p. 282) Bockris’ account is largely based on the description of the event that appears in Popism: The Warhol Sixties by Andy Warhol & Pat Hackett (p. 242). In Popism, Warhol (via Pat Hackett) says “the grate to the elevator opened and a guy came in with a gun.” Throughout the description Warhol refers to the intruder as a stranger rather than as someone he knew. It’s clear from both descriptions that the person who attempted to rob them was not someone who was particularly close to Warhol or had collaborated with him. No such organization has ever existed in New York. Although there was work alleged to be a collaboration by Warhol, Psaier and Basquiat in the above-referenced exhibitions in Spain, there has been no authenticated collaborative works. 5. The original version of the press release number "56037" claimed "Psaier was in the right place at the right time, and became the last artist to draw and sketch the great Francis Bacon, prior to Bacon's death in Madrid in 1992." I emailed the Francis Bacon Estate on August 17, 2008, asking them if there was any truth to Nicholson's claim and their reply on August 18, 2008 was "as for Pietro Psaier’s claim to be the last one to sketch Francis Bacon before his death, we have no knowledge of this can therefore not confirm this claim." "I have been Pastor of Our Lady of Malibu church for the past twelve years and I have no recollection of any such exhibition or request. Many of the paintings and prints by "Psaier" are stamped with a "Factory Additions" or accompanied by documents with a "Factory Additions" stamp in order to prove their authenticity. Factory Additions was a company that Warhol started in New York to produce his prints. It operated from 1966 to 1974. It only produced prints by Warhol. The "Factory Additions" stamp on the Psaier paintings has nothing to do with Warhol's company. There is also a John Fairchild mentioned in regard to the famous "belt buckle" scam in which bogus counterfeit historical belt buckles were sold on Ebay and other sites. A website detailing the scam can be found here. The belt buckle scam is of interest because in at least one of the documents distributed with the Psaier paintings, it mentions that "In 1976 [Oscar] Lerman comissioned Pietro Psaier to design a custom made members bronze belt buckle for his famous London night club, Tramp." There are other problems in regard to the information being offered about Psaier, but I will deal with some of those in my response to Jacqueline Chapman's response to the The Sunday Times article. The Sunday Times article can be found here. Jacqueline Chapman's response to that article can be found here. My response to Jacqueline Chapman's response can be found in my next section: An Open Letter to Jacqueline Chapman.